Leviathan #3 Review: Turns up the insanity in another great issue – AiPT! Leviathan from Image Comics has been a pleasant surprise. 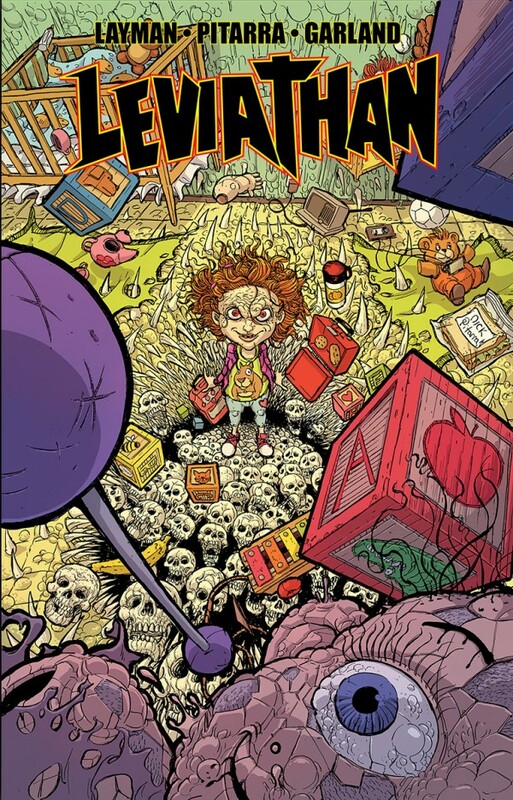 Written by John Layman with art by Nick Pitarra, Leviathan from Image Comics has been a pleasant surprise. The first two issues of the five issue run have been action packed and shown the strong love that Ryan Deluca has for his comatose girlfriend Vee Monroe. Can issue #3 continue the strong run or has the miniseries run out of steam? The first two issues of Leviathan focused on Ryan’s love for Vee and the horrific monster that Goth Jimmy had unleashed on the city. This had the twofold effect of showing Ryan and Vee were not just some passing fancy and underlined that absolute chaos the was terrorizing the city. The third issue steps away from its main character and opens the world up a little more. The issue is fast paced, sometimes only spending one panel with some character and never sticking around for more than a few pages. This is reminiscent of shows like Curb Your Enthusiasm that have a number of subplots that dovetail towards their conclusion. The technique adds to the overall story. Fleshing out the characters and the world only add to the love story that Layman was telling. Additionally, Layman provides much needed backstory. Before the latest issue of Leviathan, all readers knew was that Ryan loved Vee. There is nothing wrong with this after only two issues, but with only three issues left it’s important to further develop some sort of background before things come off as rushed. Layman starts to lay the foundation perfectly. Leviathan had already established that its titular creature was the result of an odd ritual. Issue #3 lets the reader know that Goth Jimmy’s odd plan to pass time wasn’t so random. Not only did Jimmy intentionally bring Leviathan into this world, he knows who it is and even has protection from it. The story also establishes that Jimmy is not a dirtbag just because Ryan says he is. Readers are given tangible reasons to believe he is a much worse person than Ryan realizes. Father Gabriel Baron is also further developed. In the debut issue, it did not seem he would be more than just a background character while last issue suggested he may be more involved. The third part of Leviathan hints that Father Gabriel may end up being a very important player. The moments do a great job of using Father Gabriel’s past to explain his present. This issue may also be the funniest issue in the run to date. Helping to get the humor across is the great artwork of Nick Pitarra. The exaggerated expressions and details are perfect for the story. Characters look properly ridiculous and panels are filled with jokes in the background. The funniest moment is when the reader gets to see what is inside Goth Jimmy’s suitcase. Apparently, Jimmy has a very sensitive side. Pitarra’s art also accentuates the bedlam that is taking place in Leviathan. This is a love story with some very funny moments, but the county is also in very grave danger. There are some beautiful pages in the issue, with the most impressive being Father Gabriel’s encounter with Leviathan. The colors of Michael Garland and Bill Crabtree help immensely and make the art pop off the page. Few comics are as eye catching as Leviathan. A little over halfway into its five issue run, Leviathan does a great job exploring the characters and motivations of its supporting cast. The story is funny and action packed while the art is stunning. John Layman and Nick Pitarra have created a fun comic book that also happens to be great. Layman and Pitarra tell a wonderful story while remembering that the most important thing about comics is they should be fun.